We’re told it doesn’t happen very often; not quite as infrequent as snow falls in our former south of England home but certainly not a yearly occurrence. So when the white stuff started falling this afternoon I knew I had to squeeze in the time for a little photo taking trip. The light was all but gone when I managed to leave behind a collection of storm damaged computers and strike out for the Stari Grad, but I got a few reasonable photos and I enjoyed the walk. By the time we drove home tonight I seemed Mostar was back to regular rain-like precipitation. Who knows what will happen through the night but if that’s it for the next few years at least I got my photos and a little bit of video! 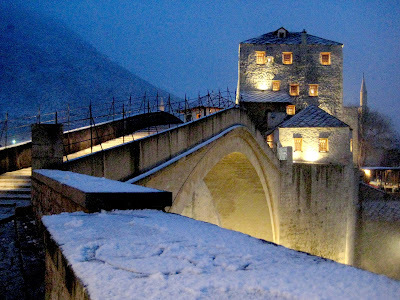 Mostar must look beautiful in the snow. Wonderful. We've just had a big snow fall overnight in Tuzla. It was raining when we went to bed, and that layer of rain has frozen to ice which was then covered by snow. Absolutely lethal. And no gritters out. But somehow, unlike Britain, it doesn't appear to have caused havoc, chaos and shut down the country! More fell over night and the Stari Grad looks great today. But it seems Mostar is remarkably like the UK in it's general ground-to-a-haltness as the result of just an inch or two! That is a WONDERFUL photo. I love the lighting under the bridge. Nicely captured.